I love all of the pallet projects that can be found on Pinterest and around the web. Last summer, I was determined to build something out of pallets. Although I there are many really cool ideas for how to upcycle a pallet, I knew that I would need to keep my first project easy and within the range of my limited abilities. I searched the web and ended up finding a very simple tutorial for a pallet shelf on Ana White’s website. She is a total DIY guru who shares all kinds of great projects and tutorials….I am definitely an unofficial member of her fan club! Companies frequently advertize “free pallet pick-up”, and so these projects are very attractive to beginners like myself. I am never very concerned about making mistakes and the rustic look makes the imperfections in the final project less obvious. Pallet projects provide a great platform for practising with the power tools you may not be accustom to using. I know that for me, this has definitely been the case. I loved the idea of beginning with these little shelves as the constructions consisted of little more than a few cuts and the addition of a simple 2″ X 4″ base. I also kept the finish very simple. I used some old stain that we had around the house. I designed these shelves to serve as shoe holders in the bottom of our closets, so the finish was not all that important. My very first pallet project. This build was super easy and made a great first project. I would highly recommend this as a first time project for beginner DIYers. You can see my finished project is simple, but functional. It was a great little project for gaining comfort and confidence using the power tools and makes more difficult projects seem less intimidating. Below are some examples of how this very same shelf can be finished and used in a variety of ways. 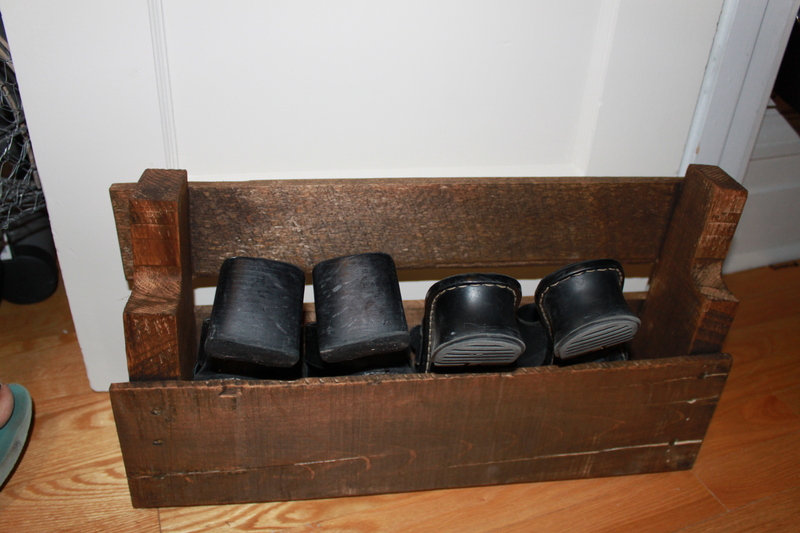 Posted on September 28, 2013 by Cindy Roy •	This entry was posted in DIY and Upcycling and tagged DIY projects, pallet projects, pallet shelf, pallet shoe rack, simple pallet project, simple pallet upcycle. Bookmark the permalink.